Sebastian and Ruby's shared room has been one of my favorite rooms to decorate in our current rental. I imagined it being a place that not only met practical needs such as storage but inspired play and creativity. I wanted them to have memories of their space being a little imaginative and full of color. I used my vintage globe collection for color inspiration. I have always loved the muted colors of these old globes and knew it would allow me to use traditionally boy and girl colors in the same space easily. I took the pinks, yellows, greens, and some aqua when putting Ruby's side together and the aqua, yellows, greens, and browns on Sebastian's side. I had this one bare wall near the entry that had so much potential that it kind of intimidated me. I wanted to do something big and fun but didn't want to spend money on more furniture or a big art piece. One day I was out thrifting when I came across the largest blank chalkboard seen above and suddenly knew I had enough to warrant a collection and that they all needed to be displayed together. I hung them a little lower than usual for practical reasons and secured them with screws and double-sided 3M tape to make sure they wouldn't fall on little toes. Our neighbor's kids came over last week and one of the little girls instantly started drawing on the chalkboard. That's when I knew it had been a good idea. In the first corner by the entrance is a bookshelf we found for free in Seattle. I've filled it with art prints from Michele Maulle, Freya, an interactive art journaling piece inspired by Shauna, some other items I've made for Ruby, and a lot of thrifted vintage toys and decor. 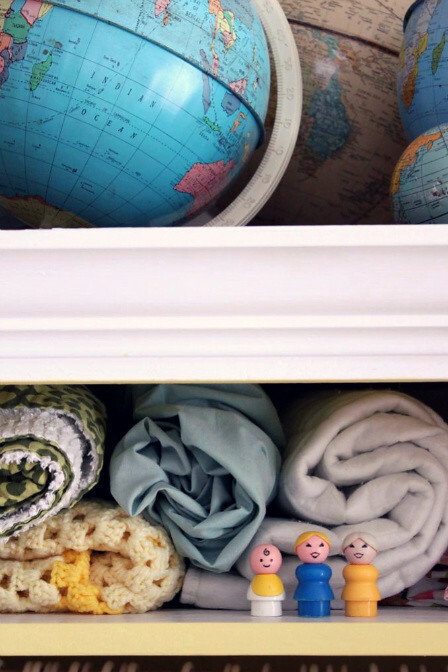 We've got photos and board books in the baskets as well as momentos from her home birth and those first few weeks together. I found this vintage fan at a shop in Ada, OK and grabbed it as soon as I saw the brand was the same as Ruby's middle name (minus an 'm'). The white wardrobe was the solution to having small closets in our last place. I found it at a resale shop, sanded it, painted it, and added a curtain rod and hooks on the top level when I was seven months pregnant with Ruby. It was one of the most enjoyable DIY's I've ever worked on because when was done I got to fill it with tiny pink clothes! The bottom houses most of their toys and games. I love having all of those loud colors out of site. The rocking horse in the foreground was one of Ruby's Christmas presents from Plan Toys and the rug was purchased new from Goodwill but is originally from Target. Ruby comes in here and lays on it almost every day. 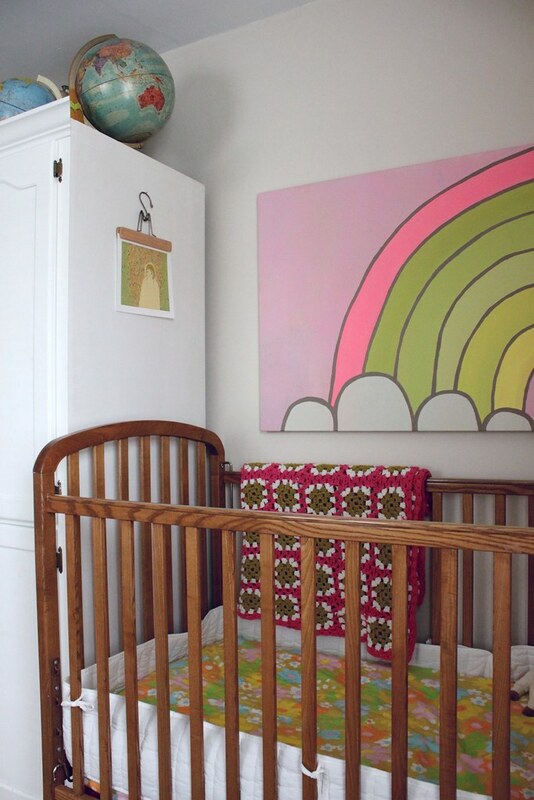 I made Ruby's crib sheets (as well as two other sets) out of vintage flat sheets, crocheted her afghan, and painted the rainbow. You can see the set up in our old house here. 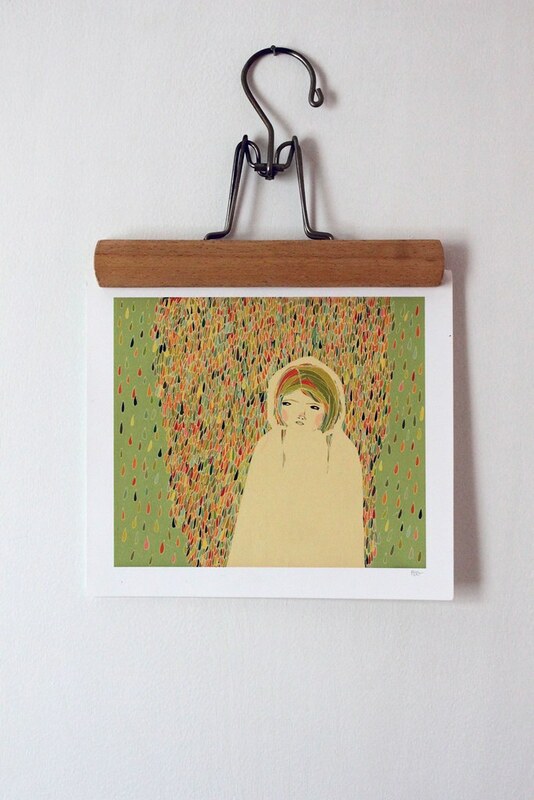 I purchased this Ashley G. print for our living room originally but it worked perfectly with these colors. I love her work. The crib skirt was handmade and the bumper is from IKEA. This is the fourth crib we've used between the two of them due to recalls, moving, and borrowing. 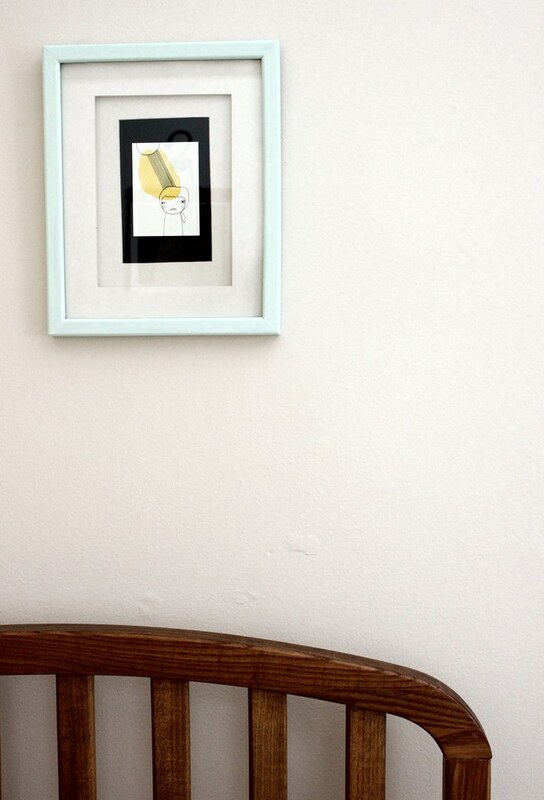 The print on the opposite side of the crib from the Ashley G. print is from Pretty Little Thieves. I made the curtains for their room from a vintage sheet as well. I really love the mid-century headboard on Sebastian's bed and was so happy to have discovered it for $7 after searching for something for months. The hand-tied quilt is vintage and the afghan was thrifted. I painted the wood grain piece three years ago and made the triangle mobile earlier this year. I've collected vintage Melmac saucers and aluminum cups in small sizes for the kids to use while playing kitchen. They're durable and extra easy on the eyes! Sebastian's 'closet' was a Billy bookshelf from IKEA that we picked up for free in Seattle and used as his wardrobe in our one bedroom apartment right after he was born. Since then I've covered the inside backing with wood grain contact paper, added a rod and hooks, and adjusted the shelving as his clothes have gotten bigger! I've thrifted various display pieces such as the signage, typewriter, and metal toy gun. He's currently into Transformers so I cleared one shelf off for him to display them without worrying about Ruby's little hands reaching them. The garland on the chalkboard wall used to be above Ruby's crib but I relocated it when I hung her rainbow painting. The Modernica rocker was a birthday gift about three years ago and the doll house was purchased on Amazon for Ruby's birthday. It's still a work in progress as I'm slowly collecting vintage Fisher Price furniture and people to fill it. It's been over four months since we moved in and I'm finally ready to call this room finished! The kids have plenty of space to dump out legos and build towers, read on the soft rug, and even play indoor basketball. I totally took the basketball hoop off the back of the door for pictures. It got us through many winter days and will probably get us through a few hot summer ones, too. I think it's really important for kids to enjoy their surroundings and I'm thankful that we've been able to create a space that fits in with the rest of the house and is easy on the eyes. It's been a fun process of collecting, thrifting, and repurposing over four plus years and has yielded us a room we all love. p.s. You can see Sebastian's room here, and how we changed it to be their room at our last house. Great job though, room is fantastic! It is such a beautiful room Rachel. So full of treasures but most of all love. You can see it in every corner. That room is so awesome. 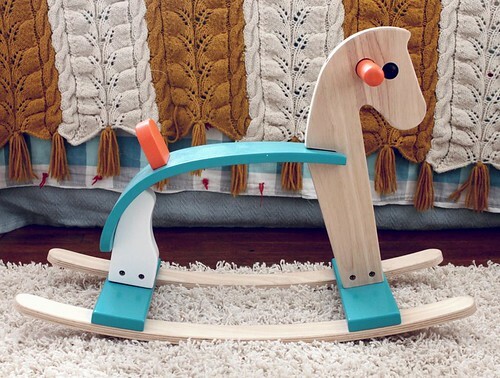 I'm going to have to check out the shop you got that cute rocking horse from and see if there is anything my little niece just has to have. There are so many beautiful touches in their room that you put together with so much love. it's so beautiful! i love the colours - like ice cream. 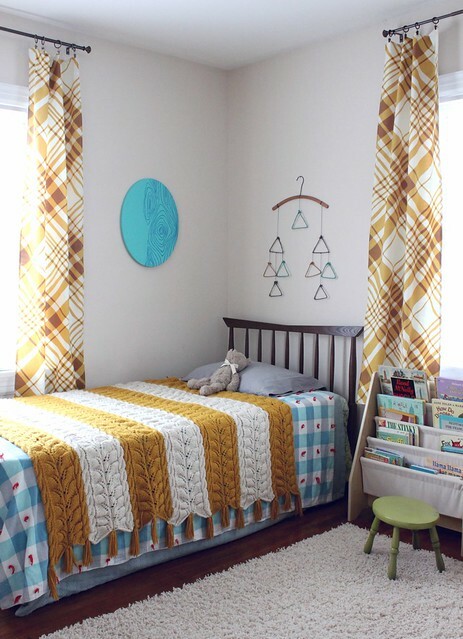 oh my gosh, love love love the mustard yellow and white stripped blanket! 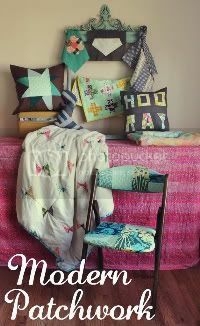 well, love the whole thing but that blanket I want to add to my collection so bad! 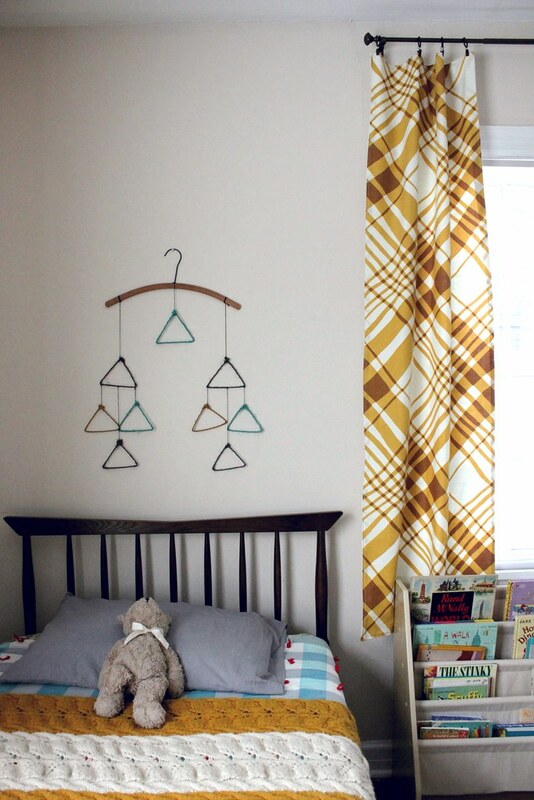 Beautifully done, and very inspiring for the nursery ideas I'm working on for our first little one. Love all your cool finds! That is so adorable! I am really inspired now to work a little more on my boys' room. I love the globes and the chalkboards! Great job! Oh Rachel, you've done it again! I love their shared room so much! Great job, friend! just perfect. your eye for detail and your design choices are so inspiring. a gorgeous space. I love this! You have such a great eye for color. What a magical place to grow up. really nice. I love it. Especially the wall hangings. This room is so precious! I'm just in love with it! It gives me about 101 ideas for my house, love it! ;) Thanks for sharing sweetie! this is ADORABLE!! you're so fun and creative!! you have done an awesome job!!! good momma! wow, I'm blown away by the colors and the efficiency!! Way to go, mama! 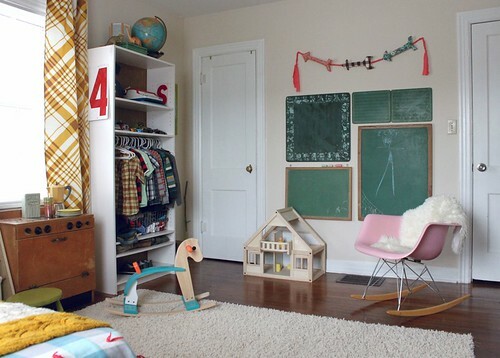 This has to be the best vintage kids' room I've ever laid eyes on. I especially love the mini kitchen, book rack (did you make that?) and the chalkboard area. One thing I've come across (we are also chalkboard lovers here) was from the blog Sew Liberated (she's a montessori teacher SAHM who loves showing their montessori spaces) and her idea with the chalkboard is to have a metal bucket hanging near the boards with the chalk and a towel of some sort for their hands--brillant. We now do that too and it saves me from wiping various white spots in our house! LOVE the tour, thanks for sharing. I love it, you are awesome as always! it's absolutely gorgeous! well done!!! I love the whole room! I just put my daughter and baby boy in the same bedroom and am looking for ways to make it "theirs." The ideas you give are great! Where did you get the book rack? I've been look for something similar since we are book lovers around here. Bravo Rachel! I really love this room! I plan on borrowing many of your design ideas for my future nursery! Thanks so much for sharing. Now I just can't wait for MORE home tours from the rest of your house!! Gorgeous, Rachel!! Really, every detail is perfect. You often see well designed kid rooms that don't look at all kid friendly - it seems like a hard balance to strike. You've pulled it off amazingly! i would love this room myself! wonderful job! So beautiful! I really really like this. So personal and lovely! Rachel, you never cease to amaze me with your design talent. you have a way of seemingly effortlessly putting together rooms that are both rich, yet simple, and so full of light. i've loved your style for years and gain so much inspiration from reading your home tour posts because we have such similar taste. this room was no exception. i only hope that i'm able to keep it all up when i have kids like you do! 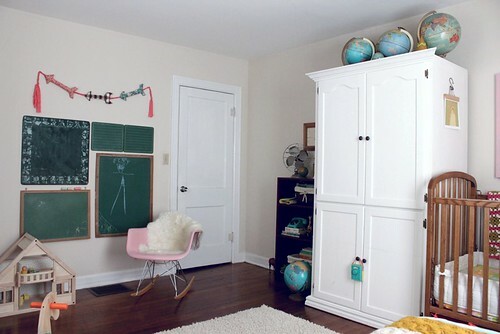 First: I love the thought and care that you put into your children's room. It's beautiful! Second: Totally planning on stealing that chalkboard idea for my children's playroom. Third: Just went back and read the birth story -- so beautiful! I had all 4 of mine at home as well, and there is nothing like it. Such a precious moment, bringing your baby out of your body and into your own home. Thank you for sharing. Oh my gosh, I am in love with these rooms! They're so bright and cheery and just the right touches on everything!! 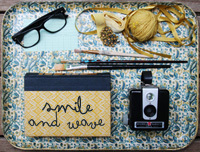 It is so harmonious and I love what you do with thrifting - turning things over as you guys grow! 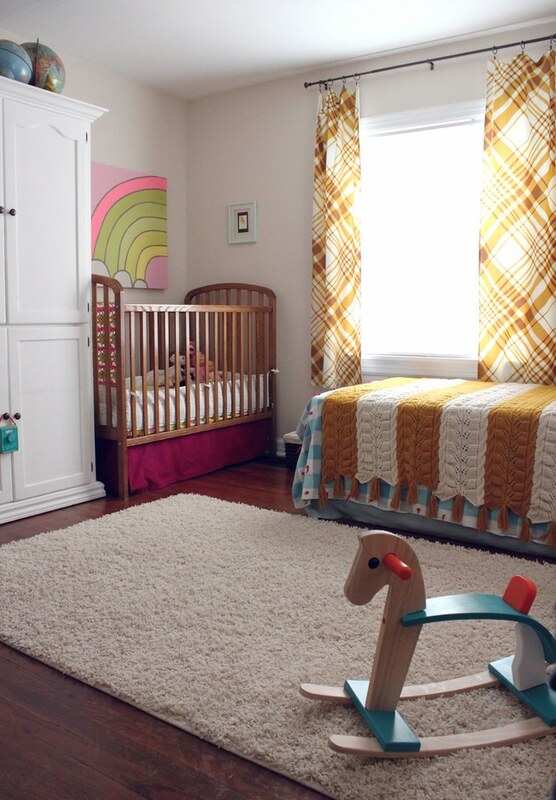 That is exactly my style - it makes me weepy to see this room - that is when I know the babymaking is necessary! Thanks Rachel! 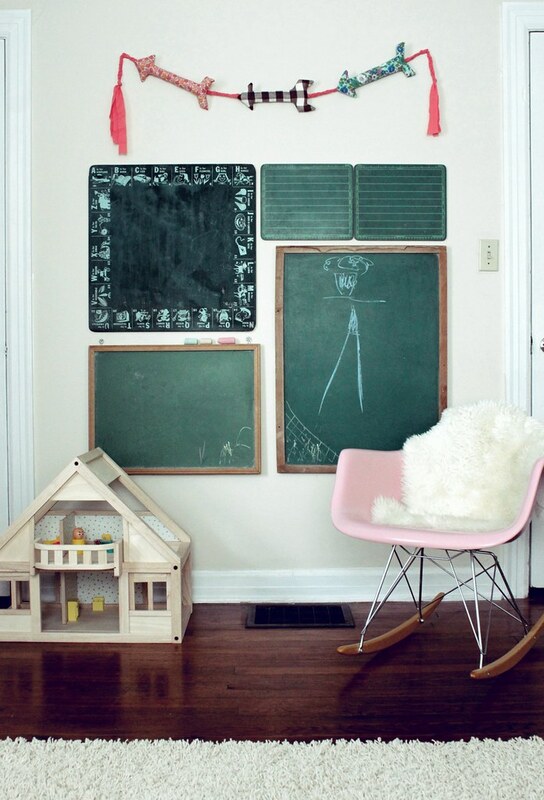 I am in love with the chalkboard wall and the vintage play kitchen. Such a great job! Love an inspiring tour! We are in the process of decorating all our boys rooms as they swap spaces (again)! I have those fisher price people too - the baby was always my favourite! Really regret biting the hair off the mummy when i was little! Wow this turned absolutely beautiful! Especially love what you did with the big white wardrobe/cabinet. Its kiddo-friendly without being ugly or gaudy. Love! Wow, it looks amazing! I absolutely love every little detail and I know your children will be full of great memories living in this special room! Such a lovely kids room. I love all the little touches and home-made bits and pieces. i love all the little details. those are the things i feel like my nursery is missing, but i think they come with time, you can't force them. and that chalkboard wall is genius! Adding almost all those pics to my files of inspiration for future nurseries. 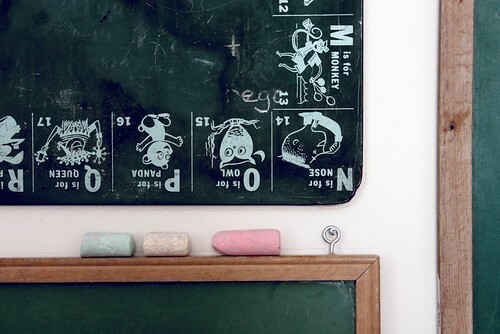 That chalkboard collage is drool-worthy! gorgeous Rachel! wow wow wow. And I'm still kicking myself over here b/c I saw that little wooden house (Plan toys also?) at Goodwill a year ago and it was one of those auction items...and I was duking it out with someone and decided to let it go. Now I wish I had it! Anyway, gorgeous lady, all of it! Oh Rachel I LOVE the new space. You have outdone yourself:) Thanks so much for sharing it! So inspiring. You always have the cutest rooms! I love that rainbow painting! 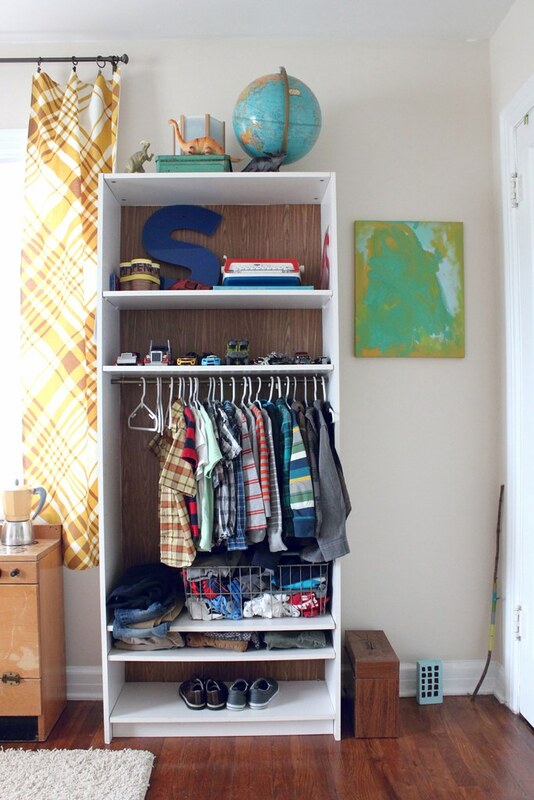 Definietly amazing how much changes you managed to find and useful for kids' room! I love it all...whenever you post room pictures I want to take down everything in my house and start over with a clean slate. I love your home! love, love, love! 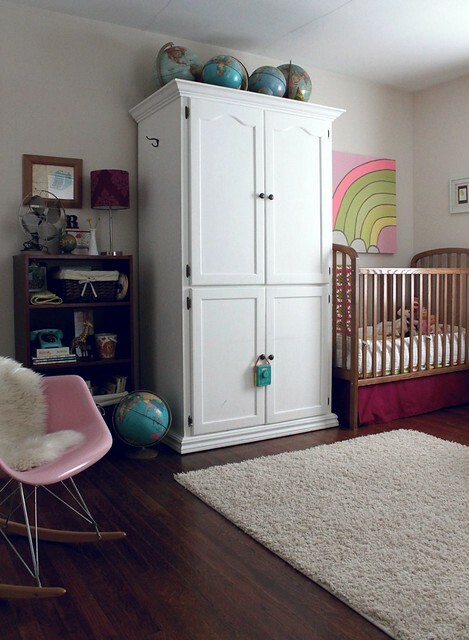 it's so inspiring, especially since i have twins who will be sharing a room for a long, long time. i have a couple of crazy questions - first, i recently tried to hang a print using a clothes hanger just like the one you used, but the darn thing kept sliding out. how do you do it? i even used some mat board behind it to make it thicker but had the same problem. 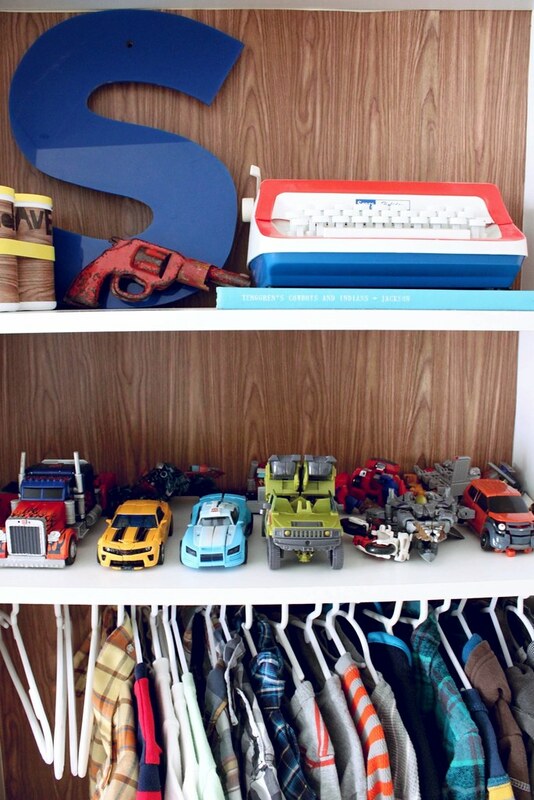 do you ever worry about the safety of vintage toys and items for your kids? how do you deal with it, practically and (for lack of a better word) emotionally? you have killer decorating sense. 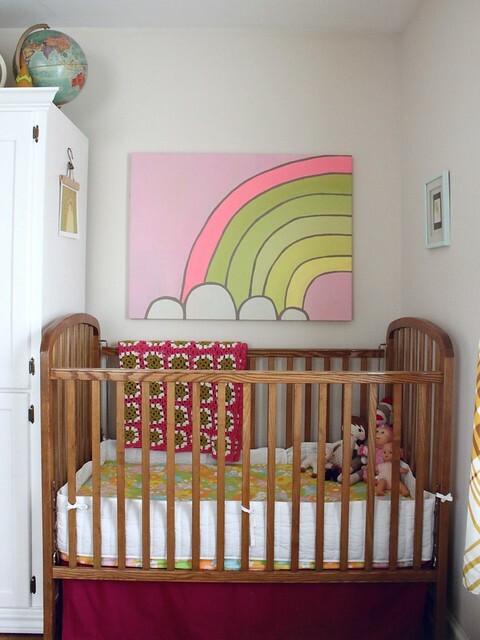 btw, you should add the rainbow painting to your flickr painting sections. I Love it!! You have such a talent!! I'm also so happy to see there are other kiddos that share a room..mine will be sharing sooon! That was really worth waiting for, Rachel! I really love it. 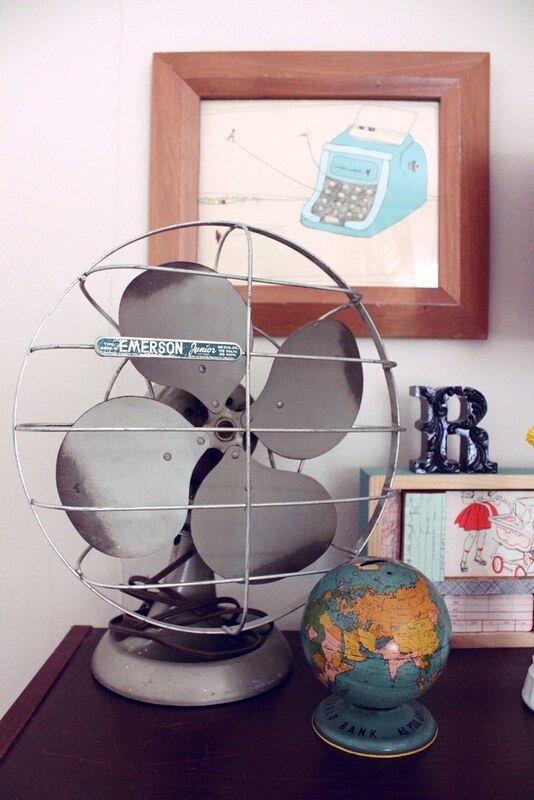 I can't believe a room can look so cute using mostly thrift store and handmade things. I love the chalkboard wall and Sebastian's bed and bedding. So cool! 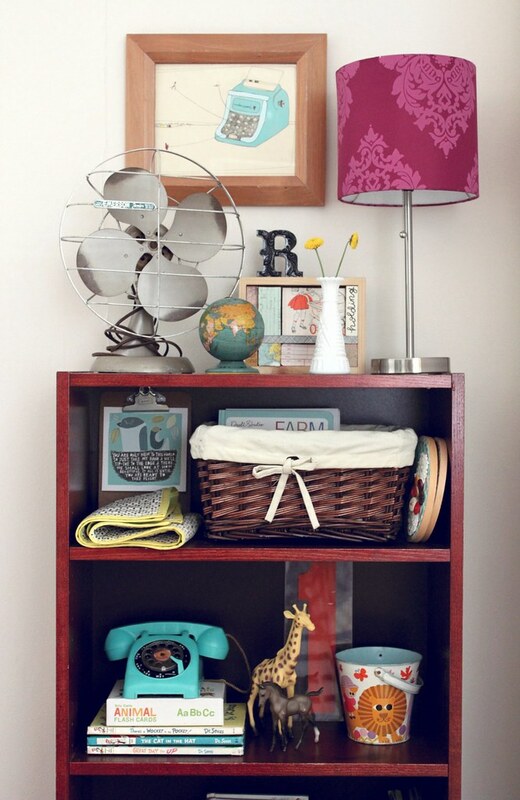 I love the photograph of the bookshelf with the lamp on top and various items such as the nice phone. 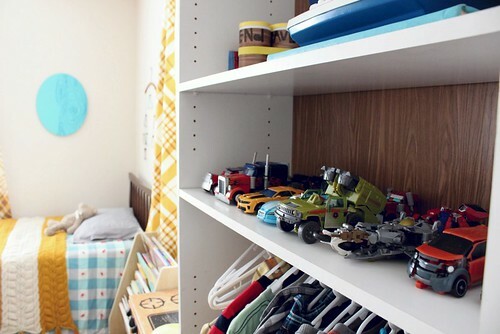 This is my dream child's room! So lovely, thanks for sharing. This is so adorable. I can't wait to have a house where Aura can have her own room and decorate it! Just wondering, I would love to know where you got the wooden dollhouse, I am on the hunt for one! this is an awesome room. we're getting ready to re-do our entire house- excellent inspiration! So inspiring - I'm starting the same process with our nursery - and have LOTS of projects - yours turned out so beautifully! Visionary! You have a fantastic sense of style. 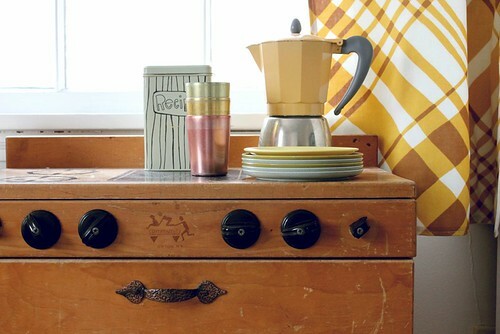 I especially love all the re-purposed vintage sheets! Thank you for sharing your space! 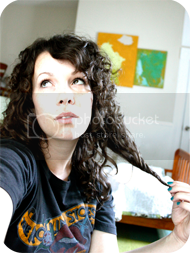 Did you see you were featured on Creature Comforts today?